The 11th Ave swing bridge is a historic landmark of the New River. Always, a bridge has spanned the north fork. 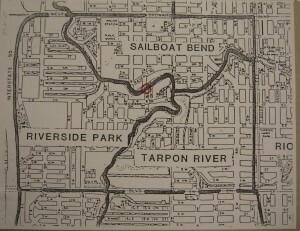 First of all was a wooden bridge at 9th Avenue, the first turn and closest spot on the fork. A single piling in the center of the river supported the wood span. After the bridge was gone, one old time resident Dillevig remembers sitting on the piling in the middle of the river and shooting alligators. After 9th Ave, residents constructed a wood span at 12th Ave. Here Bert Lasher operated a tourist attraction with Seminoles and alligator wrestling. Today 2009, from aerials you can still see the barren area at 12 Ave and imagine a bridge there. You see a forgotten road that perfectly approaches towards the north side of 12 Ave. In 1916, city officials moved the Andrews Swing bridge to 11 Ave. They needed a larger bridge for the increasing traffic across Andrews. Locals in the North Fork suggested that instead of getting rid of the bridge, they could use her. She would open to allow boat traffic and be larger, safer than the wood bridge at 12th Ave (Seminole Ave). In 1924, they decided the bridge was unsafe. From 1924-1925, mayors R.G. Snow and Will Reed, respectively, organized construction of a new swing bridge at 11th Ave. They contracted Champion Bridge Co. to build a metal truss swing bridge across that would allow boat traffic by. The bridge could turn 360 degrees by hand crank, 180 degrees to let boats downriver through 20′ beam. In 1930, officials added a gas motor to power the bridge. The motor would be unreliable. 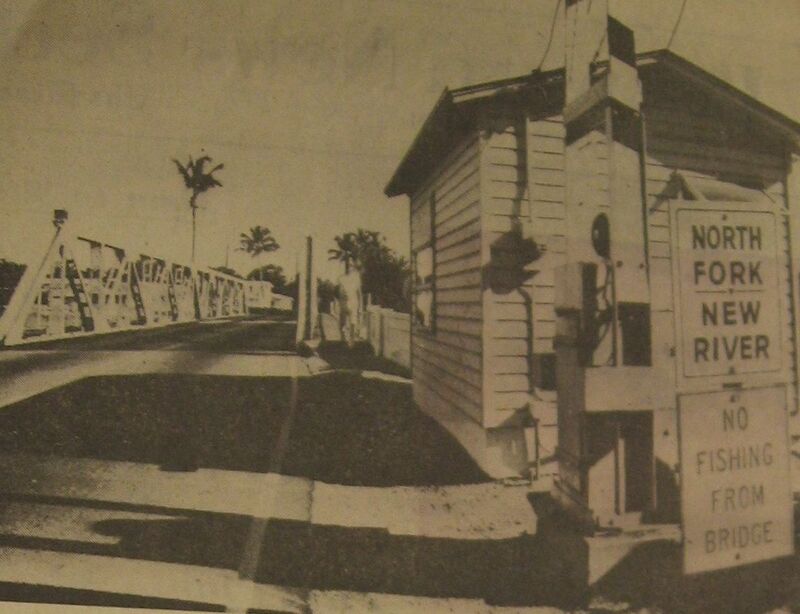 In 1950, they added a shack to house the bridge tender, keep him/her dry. In 1954, they added an electrical engine. In 1955, Mayor Carlisle claimed the bridge’s electrification as a success of his administration prematurely. Politically, his detractors lampooned his boast and voted him out of office. The bridge took the nickname, “Carlisle’s folly.” In 1956, officials invited the mayor back to cut the ribbon for the real electrification. At the grand reopening, the bridge coyly refused to operate. During this period, one adventurous tender, tired of always rotating the same direction, decided to take the bridge 180 degrees. The tender ripped out all the electrical wiring. Apparently, engineers had no longer planned for full rotations. According to Dane, the city engineer, the “bridge opens clockwise 63 degrees” still to this day. 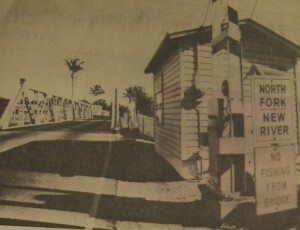 In 1971, locals first started to consider removing the swing bridge. They calculated the 46 year old bridge would take $1 million to replace at the same location, 11th Ave. 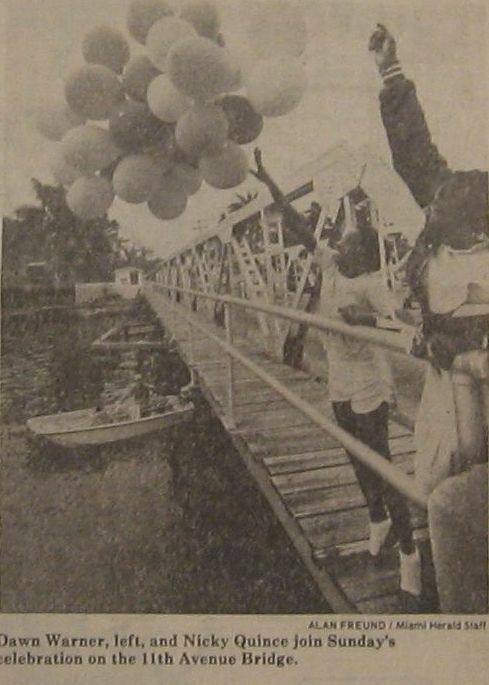 In 1972, residents voted down a bond that included funds to rebuild the bridge. 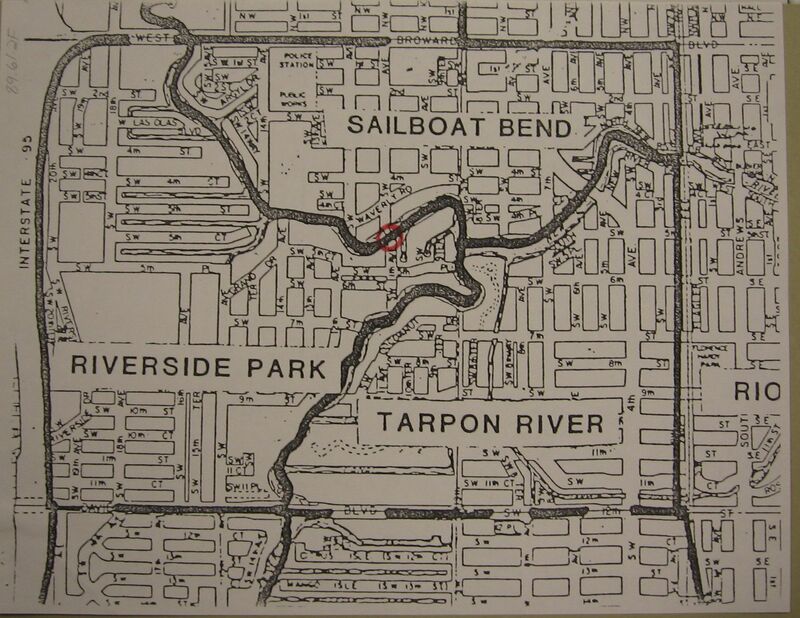 In 1973, they decided on replacing her with a fixed bridge at 14th Ave, a more southerly and commercial route. Boaters disliked the idea. More powerfully, locals liked the bridge. Again, residents voted against the bond. In 1979, another round of replacement talk of the 54 year old bridge started. A real battle ensued. Bridge haters cited the decrease in crime and traffic without the bridge. Bridge lovers decried the lack of access for emergency vehicles, fire engines, and police. But, the swing bridge continued to be a survivor. By 1981, the city engineer in charge, Henry Talton, was saying, “This is going to be here when I’m dead. I’m convinced of that. The structure will be here forever.” People really were attached to the bridge. In 1982, the bridge closed for 14 months for repairs. She needed new gear and ring repairs. In March 1984, residents celebrated her reopening – prematurely. She coyly, infuriating as ever refused to work. Finally in June, she really reopened. After reopening, crime and traffic returned with a vengance infuriating bridge haters. The debate continued. One vocal bridge oppenent was Sonny Irons who over the next 25 years would establish himself as the bridge’s biggest critic and arch enemy. He advised that the bridge should be removed and used as a jungle jim or artificial reef. In 2009-2010, the city is replacing the wood walkways and overhauling the electrical engine. In 1989, cultural conservationist though they had a final solution. 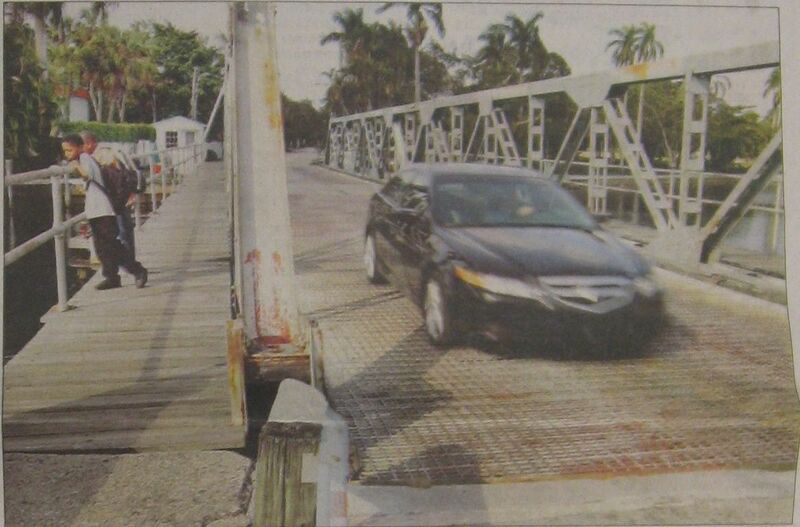 They got the swing bridge designated as a historical site in the state of Florida register. 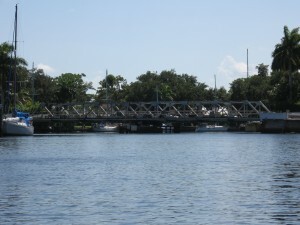 Now 64 years old, the bridge was the only operating swing bridge in south Florida. But by 1994, anti-bridge activists were back lead again by Sonny Irons. He said, “It’s in need of being removed and sand blasted… someday it’s got to go.” The historicalization really had taken hold. Feverous bridge lovers wanted the swing bridge fixed. The city agreed. In 2004, the city alloted funds for a restoration project. The bridge needed new wood walkways and an engine overhaul. In 2007, they did some work. In 2010, the bridge closed for a year to complete the restoration project. Dane the PM says, “Removal was not considered” and neither was any option but a temporary shutdown. The city is committed to keeping the swing bridge up and running.